It’s well known that over time Desktop PCs and laptops start to slow down due to all the bloatware and performance tasks the computer undertakes each day. And unless great care is taken each uninstalled program leaves junk behind to slow things down even further. It’s no different with smart phones. 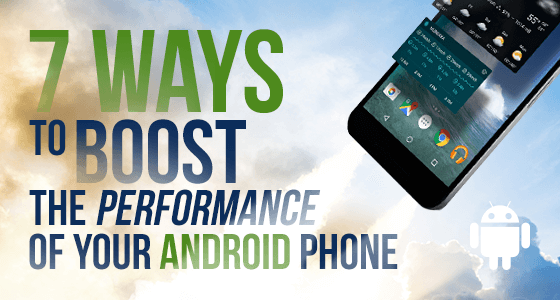 Over time the performance of your Android OS will start to diminish. In order to get the best out of your phone you have to be careful what you download onto it, and be ruthless about offloading any unwanted or clunky apps that slow down performance. It is extremely tempting to trial swathes of new apps on Google Play store, but here are 7 top tips to keep your phone in tip top shape. A smart phone’s RAM and OS can be quickly consumed by resource-hungry apps which sap performance and make everything seem slower and more labored. If you notice typing messages is becoming slower, apps are taking longer to open, and your phone seems to be working too hard to do simple tasks, it’s a sure sign you have an overloaded phone, and it’s time to uninstall as many apps as you can spare. Keep your phone lean and mean. Apps eat away at your storage space and can slow down background processes. The more storage space occupied or the more background processes running on your phone, the slower your phone’s performance. If you don’t want an app, long press on the icon and click Uninstall. Always ensure your phone is updated to the latest version of firmware. There are important performance tweaks with each new release of the Android operating system. They help to improve stability, produce higher performance speed and greater connectivity. 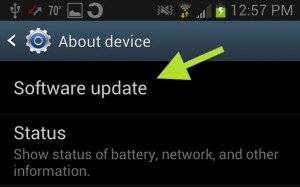 You can check if your phone has the latest upgrade by going to Settings and clicking on About Phone, then Check for Updates. Some apps you might want to keep even though you don’t use them every day. You can disable these apps by using Performance Assistant. Disabled apps are not shown on the home screen or app tray but you can re-enable them for use whenever you need them. Apps change over time. They are regularly improved and updated, and it will improve the performance of your phone if you regularly update your phone’s installed apps from Google Play. Developers frequently fix bugs and add useful new features in newly released versions of apps. As a result of this, regularly updated apps perform better and faster, and will be less likely to crash or slow down your phone. The memory card in your phone is the storage capacity available to you. The more space you have, the more you can store. If your phone has low internal memory, why not boost it with a high-capacity memory card. A good storage card not only adds storage space but also helps to speed up your phone. Storage cards are available in a range of sizes from 2GB right up to 128GB. Always go for memory cards of Class 6 or Class 10 for your Android phone to improve on performance. While live wallpapers on your phone can be a lot of fun and attract plenty of attention, many of those provided by the various phone manufacturers are poorly made, chew up a lot of megabytes and will require more CPU cycles to run. This is a sure-fire way to drain your battery fast. 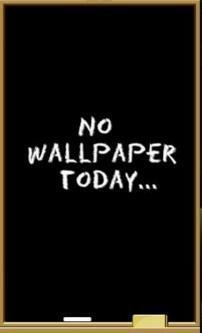 Unless you have a high capacity, high performance RAM phone, try to avoid using a live wallpaper. While Sync is a useful feature as it synchronizes your data with Google servers, keeping sync on permanently means you can reduce your phone’s performance. Sync notifies you whenever new mail comes in or when you get new notifications or updates for apps. In order to sync your phone it performs a refresh at preset intervals. To reduce the amount of processing your phone performs, you can opt to keep Sync off for unrequired services or have it on only when you need to transfer or upload materials to Google servers. 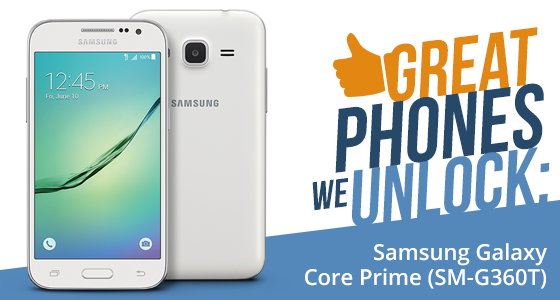 If you insist on Samsung quality but you don’t want to pay Samsung’s high-end phone prices, the entry level Galaxy Core Prime could be just the phone you’re looking for. It’s an all-plastic phone that manages to look and perform dependably above its weight. Its slim line good looks are inspired by some of Samsung’s bigger, more powerful phones, so while it is a budget model, it doesn’t perform like a budget phone. The build quality is good, with smooth curves and a brushed metallic bezel and the battery is removable so you can add up to 128GB of storage via the microSD card slot that sits on top of the single micro SIM slot. The phone runs on a 1.2GHz quad-core processor – a SnapDragon 410, with Adreno 306 graphics, 1GB of RAM and 8GB of storage (5.3GB is usable). In general use the phone performs at a good rate but for some heavier apps there can be slight delays when launched. At 4.5” inches, the WVGA screen is also smaller than some of the currently popular 5.5” phablet style phones, but it certainly makes up for lack of size with ease of portability as it could comfortably fit into a shirt pocket, so it’s perfect to carry around for summer months wearing just shirtsleeves. The Samsung Galaxy Core Prime has 4G LTE data speeds so you can stream high-quality videos, video chat and share photos with friends. It runs on the Android 5.1 Lollipop operating system with the TouchWiz interface to make navigating simple. As far as picture power is concerned, the phone has a front facing 2MP camera for easy selfies and a higher quality 5MP camera on the back with Auto Focus and a rear LED flash. Battery power is boosted when it’s in Ultra Power Saving Mode; the battery continues to power the phone even when it’s critically low. It works by turning most of your screens to black and white and shuts off nonessential apps, so your smartphone still works when you need it. T-Mobile USA was selling the Galaxy Core Prime for cash for $139.99 or just $5.84 per month with no money down. Device Unlock is an Android app that allows you to request and apply a mobile device unlock directly from the device. This allows you to automatically apply Mobile Device Unlock to the device without using a manual code. Please note that when your phone is locked with “Mobile Device Unlock” it’s totally useless to order an unlock code. Just ensure your phone is clean, and not reported as lost or stolen. With its Super AMOLED display, the highly successful and value for money mid-range Samsung Galaxy J series offers quality and performance capabilities that would have been considered high-end even just two or three years ago. The J7, bigger brother to the J5, enables you to upgrade your photo-viewing, video-watching and gameplay sessions with rich, true-to-life color reproduction and an exceptional contrast ratio for deeper blacks. The Samsung Galaxy J7, which was introduced a little earlier this year, features an immersive 5.5-inch HD Super AMOLED display, a 1.7GHz Octa-Core Exynos 7870 SoC, with 2GB of RAM, 16GB of on-board storage, a 13-megapixel rear camera, a 5-megapixel front camera, and a 3,300 mAh battery. MicroSD support is also included, as is LTE network connectivity. Running on Android 6.0.1 Marshmallow, T-Mobile and MetroPCS, the two major service providers that stock the J7, have different marketing strategies to entice you to buy the phone, and both of them are tempting. 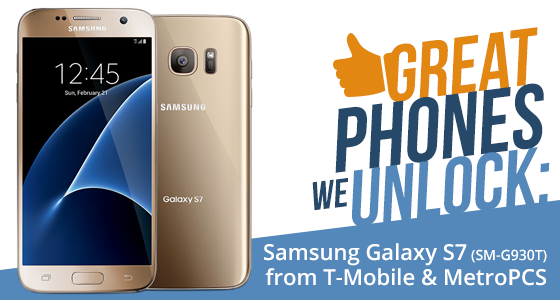 T-Mobile USA offers the Samsung Galaxy J7 for only $239.99, and comes with a second phone free provided you pay with a prepaid MasterCard credit card. 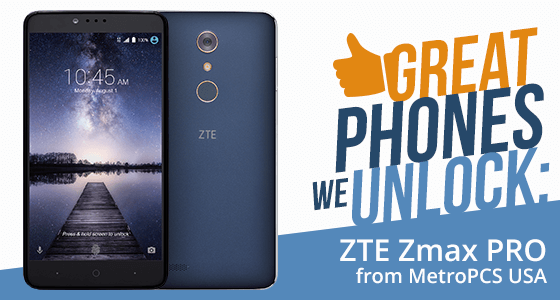 While MetroPCS USA does not offer a free second phone but opts instead for a super low price for the J7 of just $179.00. Whether you’re watching an HD streaming movie or reading a book, the Samsung Galaxy J7 is more involving thanks to the large 5.5″ HD Super AMOLED display. And while the 13MP main camera captures clearer photos, the 5MP front camera gives you fast and flattering selfies even in low light conditions. The 3,300 mAh battery has the power to keep up with your demands. 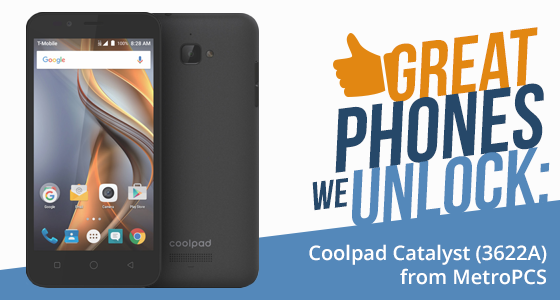 The phone comes with in-built Ultra Data Saving which compresses data and restricts background apps from chewing up too much data, thereby supplying an unfailingly fast and cost efficient 4G experience. Most customers are able to quickly and cost effectively permanently unlock their phone within 5 minutes using the app. However, should any problems arise, UnlockBase also offers a 24/7 365 day a year service center manned not by robots but living, breathing human beings ready day or night to help answer your questions. UnlockBase also offers a 100% money back guarantee if you are not delighted with the service, and, should you find a genuinely cheaper like for like deal elsewhere UnlockBase will either match it or better it. This is an oldie but goodie from Sony Xperia, and was originally released in the United States in October 2014. 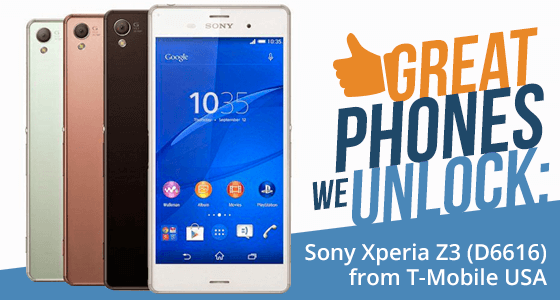 Yes, in cellphone terms that’s an ice age ago, but the Sony Xperia Z3 remains a popular phone to unlock, and a fast seller on eBay and other auctions sites. The Xperia Z3 hails the entry for Sony of design aesthetics such as a curved bezel. Like its predecessors, the Xperia Z3’s design consists of a metal frame with a glass backing; with the metal frame being rounded, while the device itself is slightly slimmer than the earlier Z2. Equipped with a near phablet sized 5.2” FHD screen, the Sony Xperia Z3 carries slightly higher IP ratings for water and dust-proofing than the Z2. With a 1080p display and a density of 424 ppi, it also features Sony’s “Triluminos” technology. Incorporating years of Sony camera expertise, the Xperia Z3 includes Cyber-shot and Handycam technologies for bright, crisp, and super sharp photography. The rear facing camera is a mighty 20.7 Megapixels with a Sony Exmor RS image sensor, along with improvements to “SteadyShot” and “Intelligent Active” modes. It also has ISO 12800 sensitivity, enabling you to capture moments in low light. The phone comes with a 2.5 GHz quad-core Qualcomm Snapdragon 801 system-on-chip with 3 GB of RAM, with Google Android 6.0 (Marshmallow). The Z3 includes a non-removable 3100 mAh battery with up to two days of battery life. The phone runs on a single nano sim card upgradeable to 128GB via the microSD slot. At the time of its release in the fall of 2014, the phone was compared favorably with the Samsung S4. The phone was on the market offered by T-Mobile in black, and some of these phones are still locked with an RSU App. If this is not what you want and you are keen to get rid of it, UnlockBase can help. With the largest database on the web for phones and service providers, UnlockBase will not be beaten on price. For just $29.90 we can unlock and free up your Sony Xperia X3 in less than 24 Hours using the official Android Official Unlock for T-Mobile USA. Before you order the app make it’s important to make sure your phone is free of any viruses and is not blacklisted, or else the app will not be able to help you. The new Samsung Galaxy S7 is slim, but in a big way. It looks the part, with a 5.1 inch Quad HD Super AMOLED screen protected by scratchproof 3D glass. The sleek glass and metal, refined and streamlined with ergonomic curves, ensures a comfortable, secure grip. As for performance, it’s huge, with more advanced cameras, more responsive software functionality and superb connectivity to enjoy the full gamut of products, services, and online experiences. The phone comes with a microSD card slot upgradeable to 200GB and fast wired and wireless charging technology. As a practical phone to carry with you, the Samsung Galaxy S7 received an IP68 rating to make it water resistant to spills, splashes. Even dropping it in water won’t slow down the Galaxy S7. The Galaxy S7 is available at T-Mobile for $669.99 or $27.92 per month for 24 months with $0 down. For a limited time, you can also get 50% off a Samsung Tab A 8.0 via Prepaid MasterCard™ Card when you purchase a select Samsung Galaxy Smartphone. 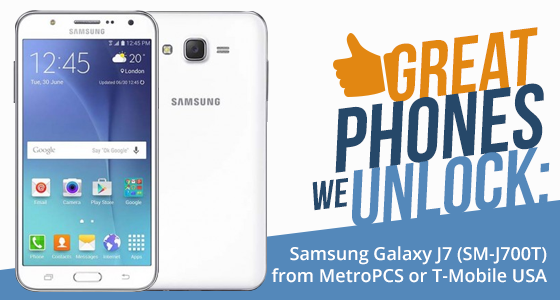 MetroPCS offer the Samsung Galaxy S7 for $649.00 or with monthly payments starting from $30.00. No matter how much you love your phone, you don’t have to be stuck with your service provider. UnlockBase, the web’s leading remote cellphone unlocking service, is here to help. We can quickly, efficiently and economically unlock your Samsung Galaxy S7 using the Device Unlock App. Device Unlock is an Android app that allows you to request and apply a mobile device unlock directly from the device. This allows you to automatically apply Mobile Device Unlock to the device without using a manual code. When your phone is locked with “Mobile Device Unlock” it’s totally useless to order an unlock code. Unlocking your Samsung Galaxy S7 costs just $24 if from MetroPCS, and $29.9 if from T-Mobile USA . Should you find a genuine cheaper offer to unlock your phone elsewhere we promise to match or better it. Before using the app, you need to be sure your phone is 100% clean, not stolen or blacklisted. The new LG G5 is the first modular smartphone from the South Korean company, and it comes in an all-metal design, so you can upgrade it with accessories, but still appreciate the sleek look and feel. Key new features for the LG 5 include a uni-body design, an easy to slide-out battery, and MicroSD card slot, so you can add more power and memory quickly and easily. The screen is a 5.3” Quad HD screen with a high-contrast display with daylight mode. As far as cameras are concerned, they are dual rear-facing with standard and ultra-wide-angle lenses. There’s an 8MP camera at the front and 16MP on the rear. The 135° lens means you can capture a sprawling skyline, a stadium concert, or the full length of a beach. You can also zoom out ultra-wide (0.5X) – it’s a first for a smartphone. You can take a variety of photos and videos from a micro close-up to a macro scene by simply pinching the screen. The phone measures 149.4 x 73.9 x 7.7mm, and unlike its G series predecessors, it’s not curved and is smaller and easier to hold. Reaching all corners of the screen is now possible. The LG 5 features Always-on display so there’s no need to press the button to check the time, date, or notifications, just a glance gives you the information you need. Despite the Always-on display, to minimize power consumption, LG redesigned the display driver IC memory and power management function so that the display’s backlight only illuminates one small part of the overall display. This means the Always-on Display requires only 0.8 percent of the battery’s full capacity per hour to remain functional. With consumers turning on their smartphones up to 150 times a day mostly to just check the time, the G5’s Always-on Display has been designed to make a notable difference in the life of the battery over the course of the day. For greater connectivity, the LG G5’s Friends Manager app enables you to connect, interact and play with all your LG owning friends. T-Mobile is currently selling the LG 5 for $629.99 or for $26.25 a month for 24 months with $0 down. If you want the freedom to choose your own service provider, no problem. UnlockBase, the web’s leading remote cellphone unlocking service, is here to help. We can quickly, efficiently and economically unlock your LG5 using the Device Unlock App. Device Unlock is an Android app that allows you to request and apply a mobile device unlock directly from the device. This allows you to automatically apply Mobile Device Unlock to the device without using a manual code. When your phone is locked with “Mobile Device Unlock” it’s totally useless to order an unlock code. 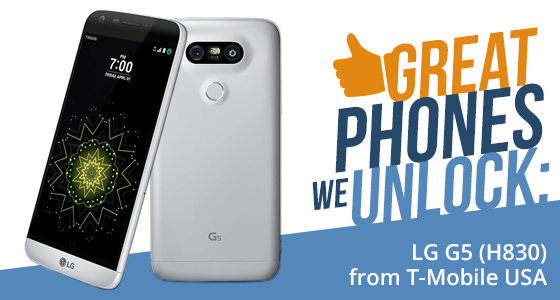 Unlocking your LG 5 costs just $29.90. Before using the app, you need to be sure your phone is 100% clean, not stolen or blacklisted. 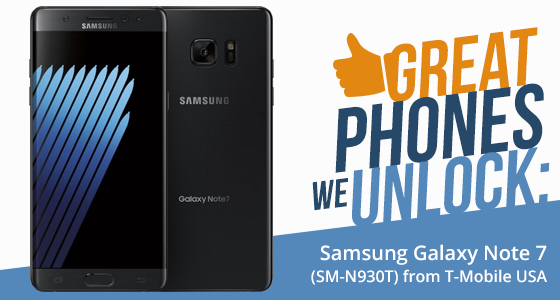 Most phablet fans would agree the Samsung Galaxy Note series is the daddy of all the phablets, consistently high quality and innovative as well as slick and easy to use. 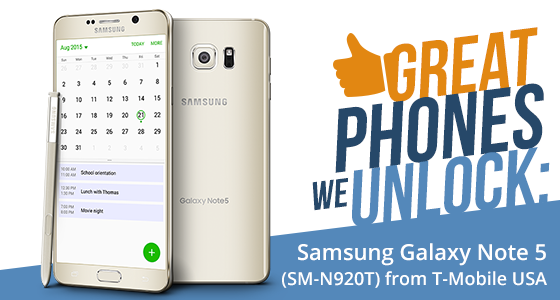 Samsung believe with the Galaxy Note5 they have delivered the best version yet. Billed as the most powerful and beautiful model yet, with a 5.7 inch Quad HD Super AMOLED (518ppi) screen, it’s still as big as ever, but now slimmer, framed by sleek aluminum metal and glass. The useful S Pen can be used on a sleek flat surface while the phone’s dual-edge back lies comfortably in the palm of your hand. In fact, the new S-Pen is now even more like an actual pen, and writes like one too on the surface of the screen. The screen is made from super tough Gorilla glass. The 32GB Samsung Galaxy Note 5 comes with a wireless charger. Just rest the phone on the charger and it’s fully powered in 120 minutes. The advantage of the wireless charger is that you can keep it with you at all times, so even when you are travelling or stopping for refreshments, your phone can stay topped up to the max. There are also a number of entertainment options with the Galaxy Note5 that a new dimension not just to using your phone, but the way you entertain yourself and your friends. This includes the ability to share your own experiences with others in real time by turning on your camera and using Live Broadcast that streams on You Tube to live the moment together. The camera also features Video Digital Imaging Stabilization in addition to Optical Image Stabilization technology so there’s no camera shake, it’s so steady it’s as if the camera is locked off, not hand held. You can record videos in 4K / UHD. There’s also a 16 MP rear camera and 5MP front camera. The camera’s Advanced Selfie technology and range of effective filters mean photos are super sharp. Pictures and videos can then be shown on a TV screen with just one tap. Connectivity is also easy with Galaxy Note5. SideSync enables you to respond to texts and get important reminders and alerts while you’re on your computer. The Samsung Galaxy S5 retails at $699 cash or $29.17 a month for 24 months from T-Mobile with $0 down. If you’re happy with everything about your choice of phone, but not your cellphone provider, you need to get in touch with Unlockbase. UnlockBase is the leading online remote unlock site, with the largest database of phones and service providers around the globe. You can unlock your Galaxy Note5 quickly, easily and cost efficiently for $29.90 using the Mobile Device Unlock App, the Android official unlock for T-Mobile USA. Just ensure your phone is clean, and not reported as lost or stolen.